Australia began to recruit PNG soldiers immediately before Japan entered the Second World War. They eventually formed five battalions of the PIR (Pacific Island Regiment). After the war, PNG soldiers continued to serve in the Australian military. 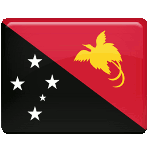 When Papua New Guinea gained independence, it established its own defense force. The date of July 23 was chosen to commemorate the First Battle of Kokoda that occurred during the New Guinea campaign of the Pacific War. This battle was fought between Allied (primarily Australian) and invading Japanese forces in the territory of Papua. It took place on July 23, 1942. National Remembrance Day commemorates PNG soldiers who served in the Australian military and servicemen of the Papua New Guinea Defense Force who died in service. It is marked with an official remembrance ceremony held at Remembrance Park in the capital city of Port Moresby. The ceremony is held in front of the war memorial that depicts the “Fuzzy Wuzzy Angel” Raphael Oimbari, aiding a wounded Australian soldier.